If you are looking for luxury houses in a beautifully and thoughtfully designed community southeast of Kansas City, Woodland Trails of Greenwood, Missouri has your new dream home for sale. Woodland Trails is a beautiful, family-oriented community. Nestled just south of the lovely city of Lee’s Summit, the luxury homes of Woodland Trails feature a large number of stunning amenities, natural scenic surroundings and beautifully designed, feature-filled homes. If you would like to learn more about our luxury homes for sale and new home builders in Kansas City, we are always happy to answer any questions. Call (816) 875-6410 today. Jim Riffe, owner of Riffe Homes, is the visionary behind our team of new home builders in Kansas City and Greenwood. Jim has been creating luxury homes and communities for more than 30 years in the Kansas City area. He knows how we live. He integrates much of the same artistic style and home design features in Woodland Trails as he did in his acclaimed development of Woodland Shores, Lee’s Summit’s premier lake community. Woodland Trails in Greenwood, Lee’s Summit’s nearest eastern neighbor, is situated just outside of Kansas City. Jim’s vision, talent and experience combine to make Woodland Trails the area’s most incredible and value-filled lifestyle package in new homes for sale. Custom home design and luxury home design should never leave you feeling limited or forced into living in a carbon copy of someone else’s house. 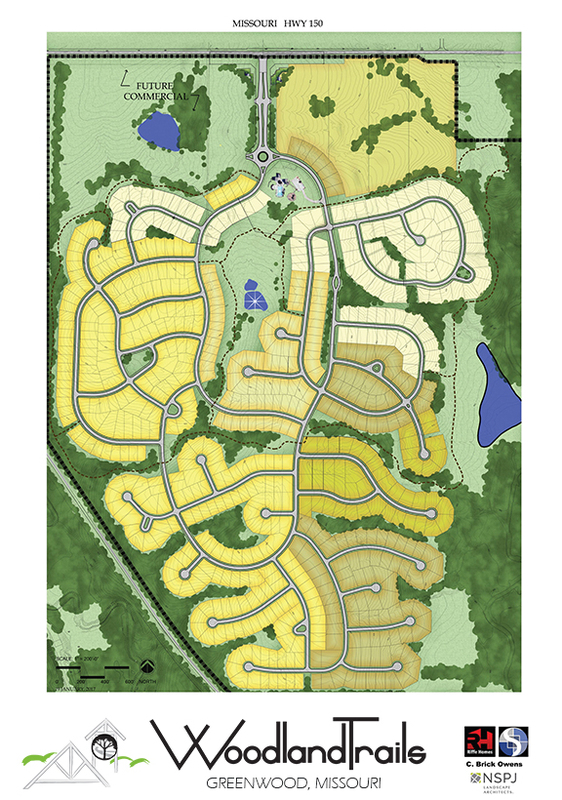 Our experienced team of new home designers and builders provides Woodland Trails home buyers with a variety of amenity-rich, luxury floor plans for custom home design that meets your standards. We work with an innovative team of only the most trusted architects and builders to make your custom home design a reality. Our high home design standards preserve the integrity of the home buyer’s investment in a luxury home design and all plans are reviewed by our award-winning architect, free of charge. Homes for sale in Woodland Trails are sprinkled amid a landscape of native oaks and elms. Homeowners can enjoy miles of beautiful walking trails, creative playscapes, a sand volleyball court, lots of expansive green space, ponds, gorges, and an array of wildlife that dwells along Big Creek. Our community is a truly one-of-a-kind and luxurious collection of homes and fantastic amenities that your whole family will love. Call Woodland Trails at (816) 875-6410 today or visit our office Thursday to Friday from 1 to 5 pm or Saturday to Sunday from 12 5 pm to browse our available luxury homes for sale in the Lee’s Summit & Kansas City area.